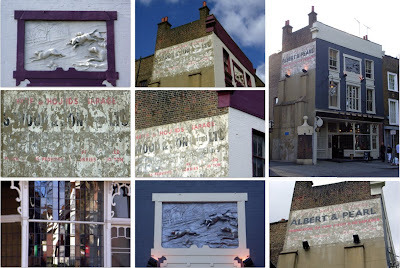 One of my favourite local ghost signs in Islington, London N1, is on the side of what used to be The Hare and Hounds in Upper Street, advertising the garage run by S Wood & Son. In recent years the pub was better known as The Medicine Bar. It has wonderful ornate windows at street level and a beautiful relief on the front showing dogs chasing a hare. The colour scheme was mainly cream with purple used to pick out the windows and frames. Earlier this month I found that the pub had been given a facelift by the new owners, Albert & Pearl. The walls and the relief are now metallic grey and the frames are cream. They have also had their own name painted over the garage sign and added spotlights on the front and side of the building. Or perhaps this is only a dry-transer. At first I thought this modern re-vamping of a ghost sign was a great idea as it has been thoughtfully and sympathetically achieved using the same colours and typefaces. Historically wall signs like this one have always been over-painted with different layers of advertisements; you can see that on the original sign that a second line of black type lettering had already been erased. But the more I have been thinking about what has happened here, the more I am concerned for the future of the original sign, especially as it appears that the original S Wood & Son lettering has been scrubbed away to make the new name more legible. The original garage sign that has been there for decades may, in a few years’ time, disappear altogether because if Albert & Pearls’ business fails, some other company will take over the premises and, rather than have the previous occupier’s name on the side, may prefer to paint over it completely. If the old sign was still there a piece of history might have been preserved for a bit longer.